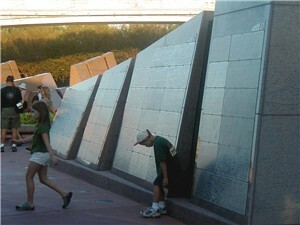 Leave a Legacy is a huge photo gallery at Epcot. It was the focal point for the Millennium Celebration. It has created a new entrance look for the Park, with 35 sculpted and polished granite monuments. Each of the stones is covered with engraved one inch square laser etched images of guests who have visited the "World". "They mailed the location to us, and it arrived about two days after we got home from our trip. They do put the proofs out at the end of the day, so that you can see your photo. When they mail you the location, they also send you two copies of the photo for you to keep." "We did it when it first started, and I feel it is totally worth it. They mail you a cool replica of your plate on a clear piece of plastic in a nice folder. That looks really nice in our photo album." "I think it's great. We had one done in Dec. 2000 of my son. He was only 4 months old. We got a discount on it because we used our American Express. I think it will be wonderful to see it many years down the line." "My husband had one done with our daughter at 8 months. You can get a $5.00 discount with your Disney Club. I can't wait to go back next year and see it up." 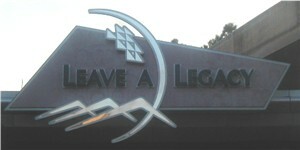 "I LOVE the Leave a Legacy concept. 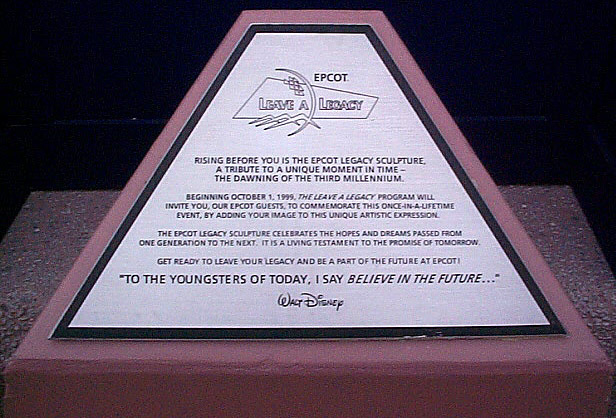 Having your own picture (or message) actually in Epcot is the greatest!" "I have 2 tiles...one is my picture and the other one is a happy birthday message to myself from June 2001." "We have done it twice. My wife and I left ours on our honeymoon in November of 1999, then we left our oldest sons in May of 2001. When we return we are doing our baby boy, on his first birthday! I'm hoping they keep the monuments up forever. I think it will be neat to see our children on a family trip thirty years from now."